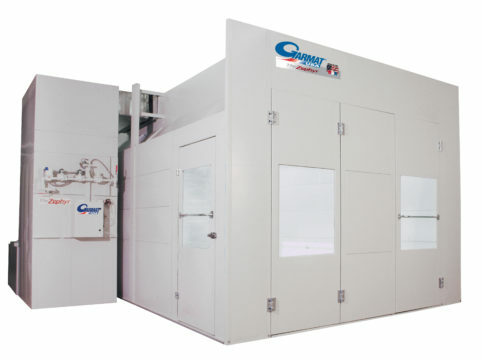 Garmat® USAs Zephyr booth is our most economically priced Downdraft Spray Booth. The Zephyr gives you the reliability and performance you have been looking for, in an economical package that fits most budgets. 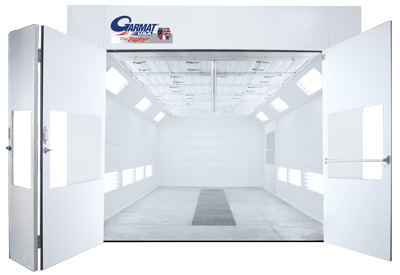 Featuring the premium air flow and optimal lighting you expect in a Garmat Paint Booth. This model features dual inlet reverse incline fans on both supply and exhaust, horizontal oriented interior accessible lighting and a single row pit. The intake and exhaust filter layouts are designed for even velocity throughout the working area of the booth providing consistent air flow required for a quality paint job. Using positive pressure within the paint booth prevents contamination from entering the booth. Cleaner air translates into cleaner higher quality paint jobs. The Zephyr cabin is constructed of durable powder coated fully insulated solid interlocking G-90 galvanized steel wall panels. Garmat PLC logic controls are designed to make every job more efficient and affordable. All Garmat USA products are provided with a listed industrial electrical control panel. All components are recognized, listed or certified by UL, ETL, or CSA. All booths come standard with a pre-wired control panel for reduced field installation time and costs. Garmat controls are built in our very own 508A ETL listed shop so every panel produced is built to the most recent ETL specifications. Employing our own ETL shop allows for infinite possibilities in customizing each shop’s panel, from the simplest functions to a touch screen complete with any imaginable paint recipe. Garmat certified staff quality controls and tests every piece of equipment that leaves the facility; we are not dependent on standards set by an outside company so we can ensure that the panel meets the quality standards Garmat Equipment is known for.